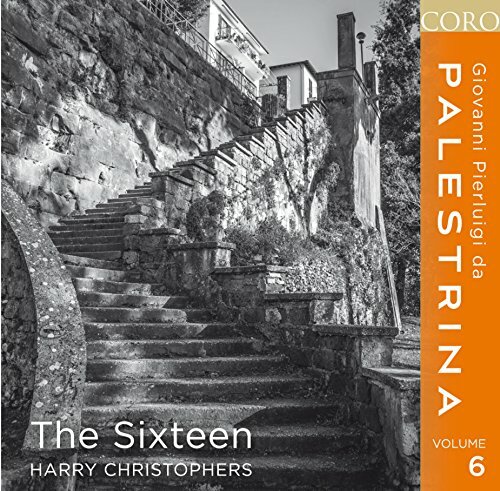 Harry Christophers and The Sixteen have released volume six of their Giovanni Pierluigi da Palestrina series on the Coro label, continuing their exploration of Palestrina's sacred choral music. This disc contains the five-part (six-part in the Agnus Dei) Missa L'Homme Arme plus penitential motets Parce mihi Domine, Peccantem me quotidie, Si amulavero in medio tribulationis, Tribulationes civitatum audivimus, Super flumina Babylonis, Tribularer si nescirem, and three of Palestrina's settings from the Song of Songs. There is always a danger when working your way through Palestrina's music that a feeling of sameness to creep in. Whilst people joke that Vivaldi wrote the same concerto 1000 times, it is just as possible to make the same joke about Palestrina masses (there are over 100 surviving). As someone who has sung Palestrina regularly, both in liturgical and non-liturgical contexts, I am aware that the music can sometimes been in danger of being more interesting for the performers than for the listeners, particularly when doing a whole mass. On this disc, Harry Christophers uses a choir of 18 singers with a mixture of men and women on the alto line. They make a strong sound, these are choral performances not vocal ensemble, but this is allied to a fine sense of line and a suppleness of phrasing. To a certain extent, this is an approach which works best when heard live in a large acoustic, perhaps on one of The Sixteen's Choral Pilgrimages (I still have fond memories of hearing them in St Alban's Abbey a few years back). This disc was made in the generous acoustic of the Church of St Alban the Martyr in Holborn and the disc captures ambience very well, surrounding the quite focussed sound of the choir with a warm aura. They open with a group of motets which are all about tribulation and sin. Parce mihi, Domine with its bleak text from the Book of Job, Peccantem me quotidie with its text starting 'I sin daily', Si amulavero in medio tribulationis, an offertory setting a text which talks of the Lord's support through difficulties, Tribulationes civitatum audivimus a responsory from Matins for the Dead and one of his best known motets Super flumina Bablyonis, By the Rivers of Babylon we sat down and wept. Palestrina's 29 motets setting texts from the Song of Songs were highly popular in his lifetime, at least they were reprinted rather a lot. Here we hear three of them Surge amica mea, Dilectus meus mihi and Surgam et circuibo civitatem; Harry Christophers and The Sixteen are working their way through all 29 on their Palestrina discs. They were intended as devotional motets, perhaps for private gatherings much as Byrd did with his large scale motets. Lively and fluid, the textures in all three are highly mobile and whilst not as seductive as perhaps the text might suggest, bring a lovely contrast tot the more sober penitential pieces on the disc. After the Song of Songs comes a finely crafted and calmly beautiful of Palestrina's setting of De profundis clamavi. Missa l'Homme Arme was published in 1570, in Palestrina's third book of masses and it uses the famous L'Homme Arme tune as the cantus firmus. Martyn Imrie in his booklet essay speculates that this might be an early work, though it must have been popular as it was reprinted after Palestrina's death. Palestrina puts the cantus firmus in the tenor, though he plays all sorts of games with the famous tune such as putting it in quick triplets in the second Kyrie, and pretending to start the cantus firmus in the bass line in the second Agnus Dei, which also includes a second soprano part. Textures throughout the mass are highly typical of Palestrina, but rendered with poise and vibrancy by the singers with the lines intertwining with a nice clarity. Throughout Palestrina's games with the cantus firmus and the other parts ensures that there is much of interest as the mass progresses finishing with a calmly beautiful and rather moving Agnus Dei, which develops a lovely rich texture when Palestrina adds the extra voice in the final Agnus Dei. The disc finishes with the motet Tribularer si nescirem which is a substantial two part responsory, again returning to the theme of tribulation, building from a simple duet to a rich structures. These performances are firmly in the English tradition of renaissance polyphony, you would not mistake them for anything else. But within that tradition, throughout, Harry Christophers elicits from The Sixteen performances which are beautifully sculpted and finely balanced, but which have a vibrancy to them as well.